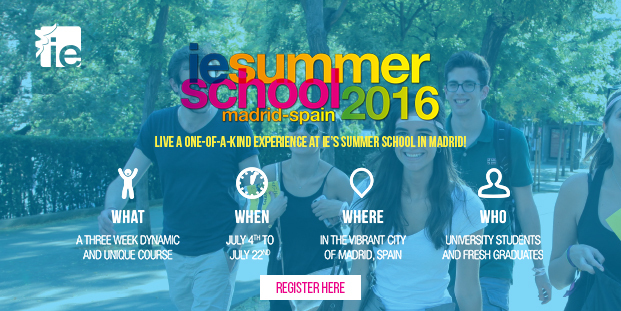 The IE Summer School courses are taught by the same outstanding faculty that teach in our internationally recognized master degrees. Classes are dynamic and very interactive and will change the way you see the world. The focus during the first week will be on developing key soft skills through workshops in public speaking, leardership, personal branding, teambulding and creative management thinking. During weeks two and three students will specialize in one of the following areas: international relations, entrepreneurship, international business law, finance or marketing & communications. For those eager to learn about other fields of study, seminars on different hot topics such as Big Data, Social Media or Neuromarketing will be offered throughout this two weeks. But the IE Summer experience goes beyond the academic. The program will give you the chance to work hand to hand with students from a diverse range of backgrounds and cultures, becoming part of a network that spans the globe and making life time friendships. To know more about it, click below.